Sign up and receive Property Email Alerts of Houses for sale in Erinvale Golf Estate, Somerset West. 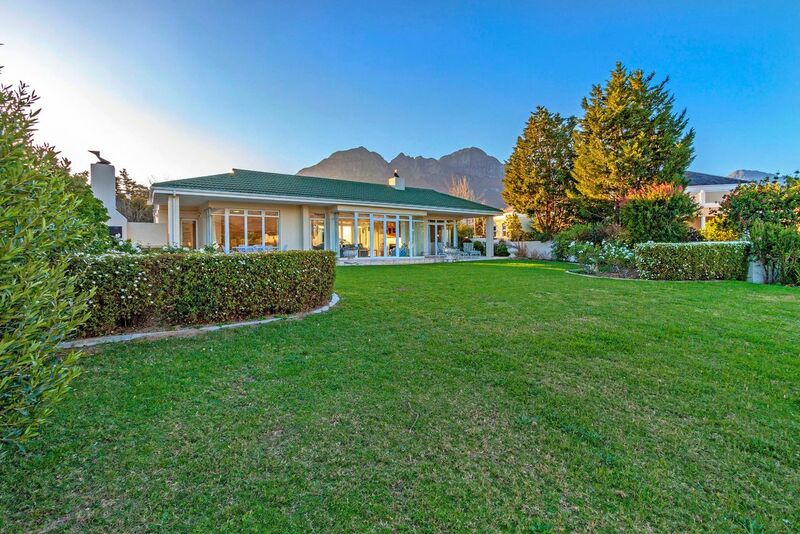 A PIECE OF HEAVEN IN ERINVALE GOLF ESTATE WITH SPECTACULAR MOUNTAIN AND GOLF COURSE VIEWS. Welcome to this immaculate home in a beautiful setting in the ever-popular Erinvale Golf Estate. This north facing home has everything a home needs as far as accommodation goes. Easy living at its best. One immediately feels that love lives in this home. Beautiful views of the mountain and of the golf course. Large main bedroom boasting a bay window for those lazy sunny days and where you can enjoy views of the great Helderberg Mountain. A jacuzzi is well placed off the main en-suite bathroom offering a great amount of privacy. The 2 other bedrooms are of generous size and share a full family bathroom. The home has great flow and was clearly well-thought out when it was designed and planned. Who can say that their view from their kitchen is amazing....this home has a beautiful view of the Hottentots Holland Mountain range as well as the golf course from the kitchen, scullery, lounge and dining room. This is a big plus for any home! The landscaped garden is well kept and very neat. There is also potential for building upstairs if one wanted. Whether you are looking for easy living or room to grow then this is the home for you. Privacy and perfection prevail in this home. Light, bright and spacious. An easy home to live in. The third bedroom can also be used as a study or TV room. All the rooms have lovely views. Large windows allow the natural light to stream through. Lounge, dining room and the kitchen is open plan with access to the patio and garden. This lovely home was built 22 years ago and one can see that the home is well built and solid. This home is perfect for the family that just want to move in. Double automated garage with direct access. Additional features: 2 x Geysers, 3 x Airconditioning units, Woodburning fireplace, underfloor heating, great street appeal and a huge amount of potential. Erinvale Golf Estate is manned 24 hours of the day. The security here is on a whole new level. The entire Estate has surveillance throughout the day and night. The Estate recently upgraded the cameras around the Estate so security is paramount here. Peace and privacy live here in this well-maintained estate with green lush gardens and a very well managed Clubhouse, Players bar, conference facilities and much, much more. When living here, one can walk to the popular Vergelegen Wine Estate as well as Lourensford farm. Fantastic area close to all private and public schools. For the kids going to school in Stellenbosch, there is also a bus that collects from nearby the Estate. One can also access the Helderberg Nature Reserve from Erinvale. What are you waiting for, call us today to arrange a viewing. Sign-up and receive Property Email Alerts of Houses for sale in Erinvale Golf Estate, Somerset West.